The Billionty-Oneth Geek: Street Fighter: The Legend of Chun-LOL!!!!!!!! Street Fighter: The Legend of Chun-LOL!!!!!!!! 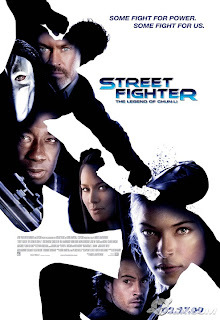 I was going to do a quick review round-up to take care of a slew of movies I've seen recently, but after some reflection, I decided that a movie with the caliber that Street Fighter: The Legend of Chun-Li has warrants it's own separate review. I mean Street Fighter was an institution during my childhood, I couldn't just gloss over it. I don't remember the plot exactly, but as I recall, it was a revenge story. Chun-Li, a musician turned martial arts expert, is after M. Bison, an evildoer Irish crime boss who was adopted at birth by Thai people. Somehow he was able to embody himself with pure evil as he injected the pure goodness in him to his daughter. Anyhow, Chun-Li is after Bison for the kidnapping and eventual killing of her father. This movie was no good. The fighting was okay and it was unintentionally funny likely because the acting was so bad. Those are the only two reasons I could come up with for not falling asleep during the movie. At least the '94 Van Damme version was so shitacular, that somehow it became cheesy good for its campiness. One of the strange things was that we see Chun-Li in the beginning as a little oriental girl, but through the quick martial-arts training montage, we see she eventually evolves into a eurasian girl. Weird? I thought it was strange that she turned eurasian, and then they revealed that the mother was of some sort of european descent. So I guess it wouldn't have been a problem except that through some miraculous birth, she was born a chinese. Another peculiar thing is that somehow Chun-Li is able to grow up in China and have the worst possible chinese accent yet at the same time have a completely fluent english accent. I'm no expert of the Mandarin language (cantonese is my first language), but even I could tell that she was butchering the language. On the brightside though, it caused intense laughter for me. I guess for someone who is totally unfamiliar with the language, this wouldn't phase them at all though. There's also a supporting crew of other Street Fighter characters, but other than through name, none of them really seem like their video game counterpart (okay, except for Vega who had a mask). The worst was Charlie Nash, played by Chris Klein of American Pie fame. There was a lot of bad acting in the movie, but his was the worst! I had no idea what he was trying to do or go for. The movie is out now for DVD if for some reason you want to see it. There's nothing I can recommend about this movie unless you relish in self-torture. I will say that this movie was bad, but it was slightly more entertaining than Dragon Ball Evolution which is the bottom of the barrel bad (alliteration!). You know, we're halfway through the year and I'm finding that it's easier to compose a worse 10 movies of the year rather than the best (which only has 2 titles so far). Here's hoping for the next 6 months. I leave you with one of my favourite cinematic moments of all time. Later geeks! Who *wouldn't* follow a man in a powder blue beret? Plus he can do the splits, 2 good reasons.